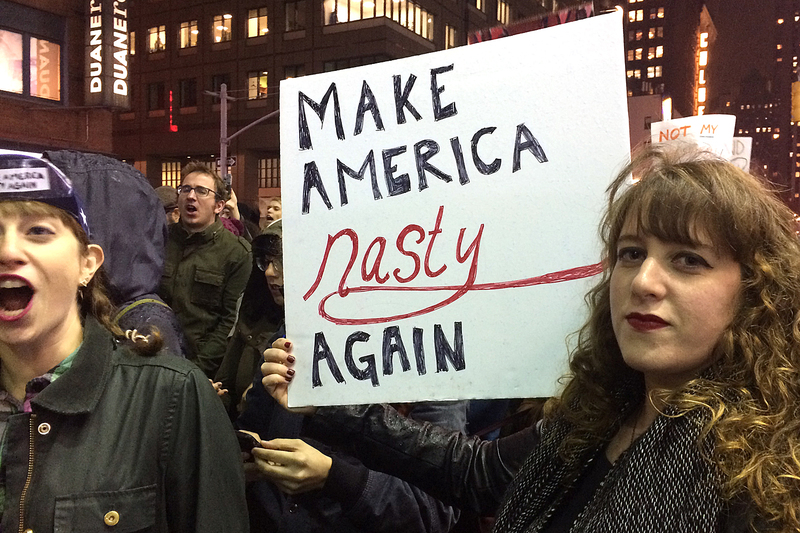 UNION SQUARE — Thousands of anti-Donald Trump protesters marched from Union Square to Trump Tower on Wednesday to vent their anger over his surprise victory in the presidential election. The protests, which appeared to dwarf any recent demonstrations in the city since the 2014 Black Lives Matter marches, lasted for more than six hours as groups of protesters marched in the streets and crowded outside Trump Tower on Fifth Avenue and the Trump International Tower and Hotel in Columbus Circle. There were 65 people arrested, mostly for disorderly conduct, a police spokesman said Thursday morning. The march — which splintered into several groups before convening as one on Trump Tower — was a raw, emotional affair that began in Union Square at about 5 p.m., as protesters streamed into the park's north plaza, chanting, hugging and crying. Williamsburg resident Nathalie Alfandary, 27, said she went out on her lunch break and later after work to offer free hugs to anyone who needed one. Demonstrators packed the plaza, chanting “not my president” and “racist, sexist, anti-gay, Donald Trump go away," until the size of the crowd appeared to force the march to begin at an hour earlier than scheduled, and the protesters headed up Broadway in the direction of Trump Tower. As the crowd headed uptown, police intermittently attempted to force the protesters onto the sidewalk. 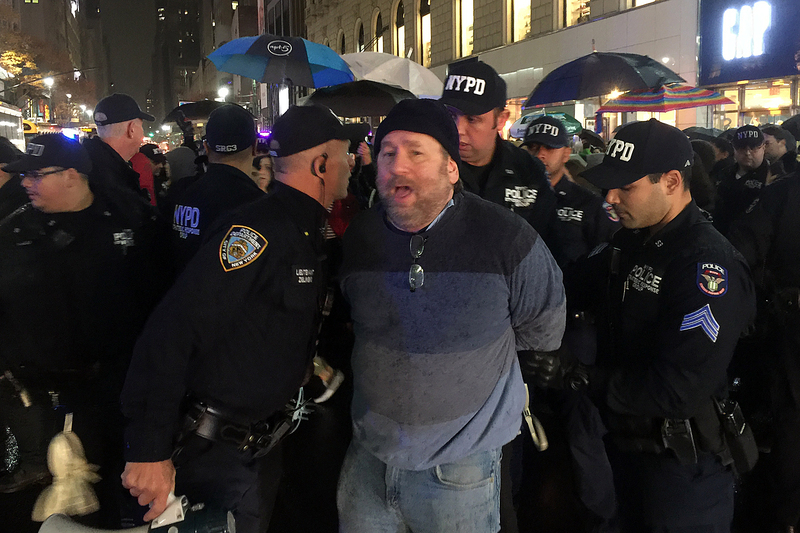 At West 34th Street and Sixth Avenue, officers handcuffed one man, identified by his daughter as Craig Wolf, as he, his daughter, her friends and hundreds of others marched up Sixth Avenue. It was not immediately clear if he was booked, but his daughter, standing on the sidewalk in confusion, appeared distraught. "He didn't do anything wrong!" she said, as representatives of the National Lawyers Guild spoke with her. The march was made up of people with diverse grievances against the president-elect, although each new chant — whether challenging racism, homophobia or Islamophobia — shouted with gusto. Ruth Nerken, 64, of Manhattan, joined the protest despite walking with a crutch, saying it was the only way she knew how to respond to the shock of a Trump victory. "I'm not surprised, but I'm horrified. I keep thinking of Stephen King. It's just so scary," Nerken said. "But I'm so happy to see everyone out here. I have so many things inside me and I think yelling is a great way to do it." The crowd continued uptown, eventually arriving a block below Trump Tower at Fifth Avenue and West 55th Street, where they were met by police and a barricade across Fifth Avenue. After a momentary standoff, marchers looped over to Sixth Avenue, east on West 57th Street filled the block in front of Trump Tower just before 8 p.m.
As more protesters began showing up, the crowd eventually ballooned to several thousand, filling the blocks of Fifth Avenue between West 55th and West 57th street from curb to curb as police and sand-filled Sanitation Department trucks kept the marchers away from Trump Tower. Brief scuffles broke out in the crowd as a group of masked protesters lit an American flag on fire and one protester tried to stop them. The flag-burners were eventually successful. Many of the protesters lashed out at the country for electing Trump. Brooklyn resident Alex Santiago, 20, expressed his anger at the electorate. "I'm not surprised," Santiago said. "This country has always been full of sh--." Julie Rossman, 30, criticized Trump for misogynistic comments. "He is a misogynist, he's a racist, and he ran a campaign on hate and lies," Rossman said.